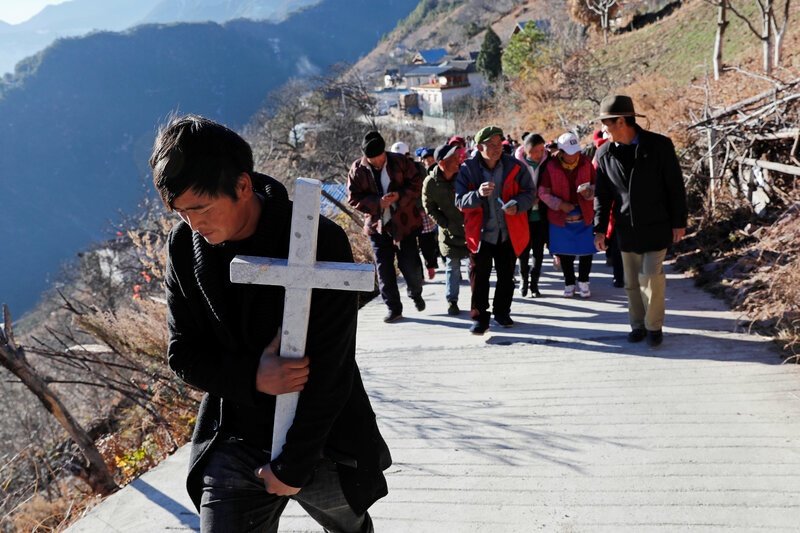 The risks for the Catholic Church in China are real—but the church is ready to face them. This past Christmas, Catholics in China rejoiced, despite the ongoing tensions between the “underground” and state-recognized church. For the first time in more than six decades, the faithful openly celebrated as one flock the incarnation of the eternal Word. For the Catholic community in the Middle Kingdom, Christ’s prayer made in agony, “that they be one,” was finally realized. The quest for unity in the Chinese Catholic Church has been a long one. The current phase can be traced to the 1950s, when Chairman Mao Zedong closed all churches and the “underground” church developed. In the late 1970s, when the government established the Chinese Catholic Patriotic Association (C.C.P.A. ), the underground church was invited to come under government registration. Some of the faithful and members of the clergy accepted. Many did not. With a new agreement between the Vatican and China on the appointment of bishops, the Catholic Church in China has entered a new era. It is true that the September 2018 accord between Beijing and the Vatican entails significant structural and political challenges and risks (see “What is at stake? The peril and promise of the China-Vatican deal,” by Paul P. Mariani, S.J., in the Jan. 7, 2019, issue of America). But untold hours of the difficult work of dialogue, by many players from both the underground and the registered church—especially in recent decades—have left the church in a better position to navigate the challenges to come. Epitomizing this phenomenon was the Diocese of Mindong in Southeast China, where the faithful had been painfully divided for years: An “underground” bishop led a large presbyterate and laity that was separated from a registered bishop who tended to a smaller presbyterate and flock. At the personal request of Pope Francis, Bishop Guo Xijin—who had been ordained the bishop by Rome—heroically agreed to accept auxiliary bishop status under the government-appointed Bishop Zhan Silu. This step—key to the Sino-Vatican accord—was infuriating to some who had courageously resisted for years and heartbreaking to many who had suffered for the cause. When this development was announced, many priests of the “underground” church, encouraged by vehement opponents in Hong Kong, the United States and elsewhere, spoke of resigning from the priesthood rather than acquiesce. And so at Christmas in Mindong, the Christ child was worshipped by a church grateful for the grace of reconciliation. Bold actions within the structures of the registered church have also brought us to this point of unity. A former seminarian, Liu Bainian of Shandong province, was named head of the C.C.P.A. in 1980. I met with him several times over the years, and he constantly invoked the Holy Spirit as he explained complex issues and his decision to work with the government so that the church could endure and thrive. When Deng Xiaoping reopened the churches in the late 1970s, it was Mr. Liu who reached out to the universal church and began the march toward reconciliation. He invited to China the Maryknoll priest Laurence T. Murphy, who was among the first to build bridges between the C.C.P.A. and the universal church. He emboldened Shanghai Bishop Jin Luxian to reach out and establish relationships with U.S. and European church leaders. Mr. Liu accepted the assistance of Cardinal John O’Connor, the archbishop of New York, in bringing Chinese bishops and priests to the United States for training. He also met with Mother Teresa in 1985 to facilitate her outreach to the Chinese church. In short, without Mr. Liu’s official work for the C.C.P.A. and his willingness to dialogue with the wider world and church, the reconciliation of Catholics that we saw in Mindong would be difficult to imagine. Finally, a key step in the pilgrimage toward unity occurred in 2015 when leaders of the Chinese episcopal conference, Bishops Ma Yinglin, Zhan Silu and Yang Xiaoting, were invited to the United States, where they met with representatives of Cardinal Sean O’Malley in Boston, spoke at the Yale University School of Divinity, Immaculate Conception seminary at Seton Hall University, the University of Notre Dame and Loyola University Chicago. They also prayed at the St. Damien shrine in Molokai, Hawaii. It was during this “journey for reconciliation” that Bishops Ma and Zhan presented a bible to Cardinal O’Malley to give to Pope Francis, inscribed “we love you, we pray for you, we await you in China” together with letters requesting full communion. Not everyone agrees that the current rapprochement between China and the Vatican warrants rejoicing. Latent pain and well-grounded fears persist. This unity is surely rife with paradox and ambiguity. It reflects a conviction that it is possible to be both a faithful disciple of the church and a loyal patriot of the homeland, to have diversity without division and autonomy without independence, to have unity without unification, and practical reconciliation beyond mere verbal forgiveness. It echos the suggestion of Phil Klay (America, 12/10/2018) that church is “an invitation to mystery, not mastery, to communion, not control.” In the final analysis the life of the church is complicated. In the final analysis the life of the church is complicated. But the vision of recent popes, the courage of bishops like Ma Yinglin and Guo Xijin, and the graced action of priests like Father Luo Wen and laypeople like Liu Bainian have enabled the universal church to better understand and take on these challenges. I continue to pray for the Church in China. The church is not facing any sort of danger, no Vatican man or Curia official has his life in the line, it is all going to fall on the people who live in China. In my opinion, this act was one of complete betrayal and it is no use virtue signalling about unity and peace and co-operation. The members of the underground church were the body of Christ, the church militant, of mainland China. There is no shame in them trying to be disciples of Christ and at the same time trying not to be imprisoned, tortured or killed. Now, the fox of the state is waiting for the little lambs to come out of safety and be identified one by one, little by little, until it is deemed that all who will expose themselves will have done so, and then it will eat them. The people in charge in China are disciples of Mao, a minion of Satan, and they learned well to do this trick. Pretend to relax restrictions or put aside threats, wait until even the timid think it is a real improvement and a genuine change and then spring the trap. Think about Hong Kong. The promises and assurances given to the British and the inhabitants; rejoin China and you will still retain you freedom and independence and prosperity. This was a lie and is being exposed as we speak. The current Roman administration acting as a paternalistic state has made martyrs unnecessarily of simple trusting Chinese men, women and children. I am appalled at that kind of articles. Does the author want to say his readers that "to preserve the unity of faith" it is all right to sacrifice the faithful catholics and their bishops for the sake of traitors, renegades and apostates ? Well, isn't it following the immoral rule of the "the goal justifies the means". It's the rule Jesuits have been accused of following for centuries all over the world ? There never was, there is not and there will never be the true unity of faith between the persecuted catholics and their persecutors or traitors. Acc. to Christ's and 1980 years of CC's orthodox morality : the apostates first have to repent, apologize and convert to the true Church and Her faith ; and not the otherwise. John A. Worthley has been a visiting professor of public administration in China since 1983. He has served as Mother Teresa’s emissary to China and facilitated the milestone 2015 reconciliation pilgrimage of Chinese bishops to the United States.